How do you begin to commission bespoke or “custom made” furniture? We’re here to help. Pick up the phone, send an e-mail or post a letter to outline your thoughts. Your own drawing will help… it doesn’t have to be a work of art… just something that gives an idea of the use of the furniture and the space available to accommodate it. Another good start is to comb through magazines or the internet looking for items that appeal to cut & paste. With a few e-mail exchanges and/or telephone conversations, we can usually arrive at a position where we can give an estimate of the likely cost of the piece or pieces you wish to commission. If you’d prefer to meet, you can make an appointment to visit or, at a small cost (later deducted from the commissioned pieces), you can request a “site visit” to give us the opportunity to see and discuss the intended location. Whether or not a site visit is requested, an exchange of pictures, sketches and ideas can soon develop a rapport, allowing us to progress the design. When you are satisfied we have developed the design that you would wish to commission, we confirm which craftsman’s skills we recommend as the most appropriate for the piece or pieces required, and then confirm the price and the estimated time to completion. The selected workshop commits the information to an order for you to “sign off” and, upon confirmation, you pay a deposit, usually of about 25%, direct to the craftsman/workshop. The order is now “live” and preparation for making can begin. 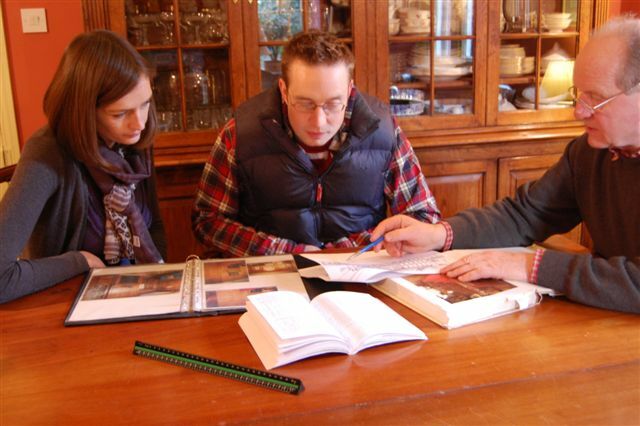 Gathering all the information together, the workshop will liaise with us to further hone the detail of the design; a cutting list of timber is prepared based on workshop drawings, and often laid out at full scale. From this, specific components are produced for the cabinet maker to work and hone into the vital ingredients of the commissioned piece. Other skills will be called upon… the brass forger for handles; perhaps a woodcarver or turner, and finally the polisher to polish and wax to a fine burnished finish.